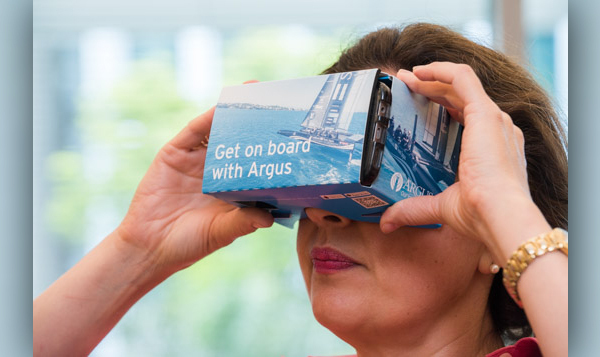 As the Official Healthcare Partner of SoftBank Team Japan – the Japanese Challenger for the America’s Cup –Argus is launching three virtual reality [VR] videos to give the community a behind the scenes look at SoftBank Team Japan as they prepare for the America’s Cup race. The company said, “Members of the public are encouraged to download the free Argus app from the Apple App or Google Play Stores and collect a pair of VR headsets from one of the following events or locations in order to watch the virtual reality videos. Argus has partnered with One Communications who will help to distribute the headsets at events and in their flagship store. One Communications flagship store, 18 Church Street, Hamilton. Throughout the America’s Cup events at the hull of the SoftBank Team Japan boat, outside the America’s Cup pop-up store on Front Street. Alison Hill, Chief Executive Officer, The Argus Group, says: “We really value our partnership with SoftBank Team Japan and have learned so much about what it takes to be a world-class athlete and participate in an event such as the America’s Cup. Schereene Outerbridge, Marketing Communications Director, One Communications, says: “One is pleased to be partnering with Argus and Softbank Team Japan to help bring the thrill of the race to all of Bermuda. As an Official Supplier to SoftBank Team Japan, the technological component of this experience is a natural fit. Dean Barker, Skipper and Chief Executive Officer, SoftBank Team Japan, says: “Racing an America’s Cup Class yacht is a unique experience and it takes a great deal of strength and stamina to do this. Jonathan Rudd, Partner/Creative Director, Parable VR, says: “Parable VR in partnership with The Gild are delighted to be part of this inspiring project. VR and 360° video offer an incredible way to take people into the heart of the action and an America’s Cup team offers the perfect backdrop. The release of the videos will be staggered over the coming weeks.